If you have ever thought of increasing the space in your home, Garden Rooms or Garden Lodges could be a perfect solution; properly self-contained and secure, they offer an attractive, weather proof, draught free, independent extension to any family home. a new low maintenance living space that could be completed in a day or two for some designs. The entire procedure from selecting your favourite look & design, right through to the completed installation for your project can be made straight forward, as many installers can offer a complete “project managed” solution from start to finish, making the whole process as easy and stress-free as possible. 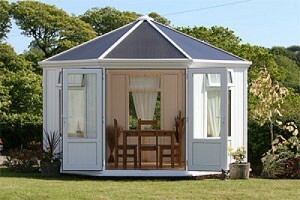 Garden rooms really are a great way to expand your living space, they are not just a garden shed – modern rooms range from the simple to the grand. “High end” bespoke designs offer Scandinavian type wooden lodges, with cladded sides, bi-fold doors or sliding doors – even air conditioning. Use your building as a home office, study or studio, play-room or just for relaxing. 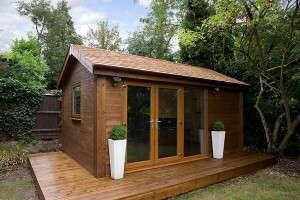 With so many designs available you can put your Garden room to almost any use. By opting for one of these amazing living spaces, there is also the potential to extend to your home or work space without becoming involved in planning permission and building regulations, our professionally certified installers have all necessary information to hand and will be aware of any planning concerns for their own installations. Many will provide detailed assistance in this matter. Our information pages can answer some questions about building regulations and planning permissions. Always check with your local planning officers, especially if you live in a National Park or Area of Outstanding Natural Beauty (AONB). If you think that this type of living space may suit your home, simply click on request quote link and we will find and compare the best professional and certified installers who should contact with you within 24 hours in order to arrange your free quotations – or, if you prefer, they can arrange convenient time to survey your property and provide written quotations.